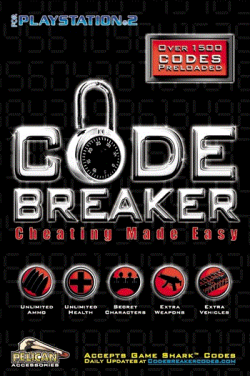 Game description: Code Breaker is a cheat device developed by Pelican Accessories. Along with competing product Action Replay, it is one of the few currently supported video game cheat devices. Code Breaker is a nice alternative to using cheats with PCSX2. Depending on your style you might like this method more than patches. You can also use the device manager to copy, delete, and even compress saves from the memory card, USB, and hard drive. In PCSX2 swap out the DVD or select the ISO and choose "Swap Disc". This page was last edited on 1 February 2016, at 08:37.